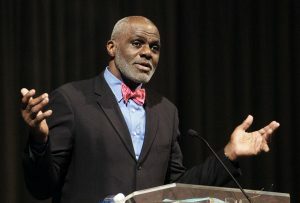 Minnesota Vikings legend Alan Page has been announced as the keynote speaker at the Siouxland Chamber of Commerce’s Annual dinner and meeting that is happening on September 22 in Sioux City, Iowa. Tickets to get into the event are $80 per person for Chamber of Commerce members and $95 dollars for non-members, and there will be sponsorships available for a limited amount that are assigned on a first-come, first-serve basis. In addition to having great seats for the event, attendees will also have admission to a private reception with the former Viking. The Canton, Ohio native started playing football during high school while attending Central Catholic High School, which assisted him in landing a spot on the Notre Dame’s fighting Irish team where he led the school to the 1966 championships. Page was drafted by the Minnesota Vikings for whom he played from 1967 to 1978, before going to the Chicago Bears for his last three years of playing in the pros before his retirement in 1981. After leaving the playing field for good, the nine-time Pro Bowl player took a major career change and became a justice of the Minnesota Supreme Court. Page will be speaking at this fall’s Siouxland Chamber of Commerce’s Annual Dinner and Meeting later on next month, and space is expected to fill up quickly, so buy your tickets as soon as possible! If your company is interested in finding out availability and booking fees for a former professional football player like Alan Page, or other sports celebrities for a Keynote Speech, Autograph Signing, Charity Event, or Football Camp, call us at 1-888-246-7141.